Twist has always been a woman of adventure, also the kind of person that things happen to. I remember stories of hanging upside down waiting to be rescued while climbing, of strange men coming into hotel rooms. Actually the strange men seem to happen less frequently these days with a six foot plus male beside her. But wherever she goes she has adventures. 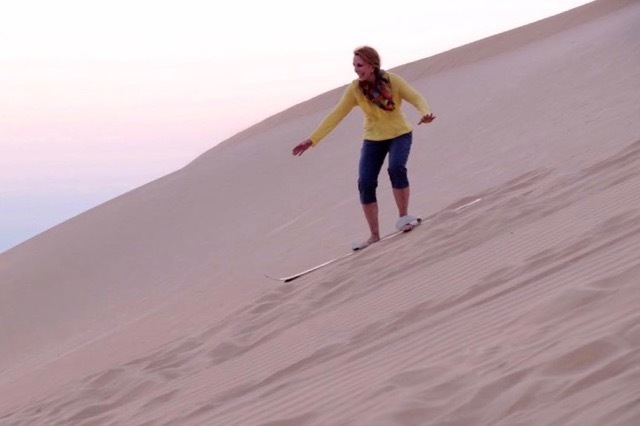 (Yes, she is sand boarding down a dune in Abu Dhabi!) And she's here today to tell you about them, also about her exciting new thriller,FAKE, featuring a traveling girl rather like herself. TWIST PHELAN: I am a traveler. Over the past three years I've visited over 50 countries and flown nearly a million miles. 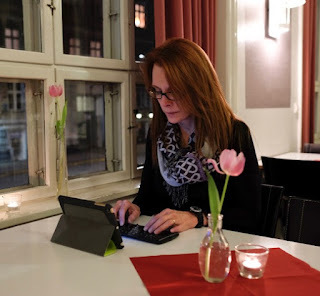 I'm peripatetic by nature, and being a mystery and thriller writer allows me to work wherever there's an outlet for my laptop and a decent WiFi connection. Even then, the latter is optional. Several people have asked me how I decide what to do and see when I go to a different country. It's easy ... and hard at the same time. When at home, I write, go to the gym, ride my bike and ski in the mountains, enjoy contemporary art/architecture/design, visit science museums and booksellers, listen to music and see plays, eat at casual healthy places, ethnic holes-in-the-wall, and "foodie" restaurants, walk or cycle through neighborhoods, shop current designers, read fiction and non-fiction, go to dinner parties ... and I do essentially the same when I travel. When I was younger, I made a point of seeing the iconic in a foreign place. That meant a lot of trips to gigantic churches and a lot of Renaissance art. But upon embarking on this latest phase of travel three years ago, I decided I'd had enough. No more scowling men in gilded frames. No more monuments to politicians. I'm not saying these things aren't interesting. They just aren't interesting to me. Now when I see or do the iconic when I travel, it is because it appeals or interests me, not because I'm supposed to. As Erle Stanley Gardner said, “I like what I like and not what I'm supposed to like because of mass rating.” I happily rode in a gondola in Venice because it was something I thought would be romantic, not because a guide book told me it would be. And despite four trips in two years to Florence, I have yet to make it back to the Uffizi Gallery. I might one day, but there are still many other things I want to do and places I want to explore first in that city. It's quite liberating—and a bit scary—to decide nothing in the world is a must-do. It makes you responsible for your own good time. And your own fails. When I have no set agenda, I've happened onto some extraordinary experiences. At Lago di Garda in Italy, pausing to watch the sailboats ended with me and my traveling companion being drafted to compete in the race. Lingering in a restaurant in Jaipur, India led to an invitation to a three-day wedding celebration. Of course even when things go wrong, it can turn into a memorable experience. Accepting an invitation to go paragliding in Cartagena, Colombia resulted in a cracked shinbone, but I will never forget the (literally) bird's-eye view of the city! On your next trip, consider skipping at least some of the Top Ten Things to See in [insert city name], and instead make your way to a neighborhood café or an art-movie house or a golf course, or whatever it is you enjoy doing at home. Chances are, you'll enjoy doing it in the city you are visiting as well. 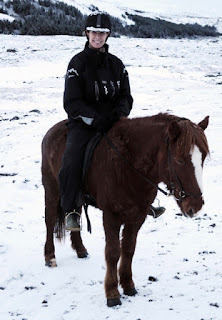 RHYS: Twist shares her adventures on her Facebook page, her newsletter and her blog on her website. Great reading for armchair travelers! 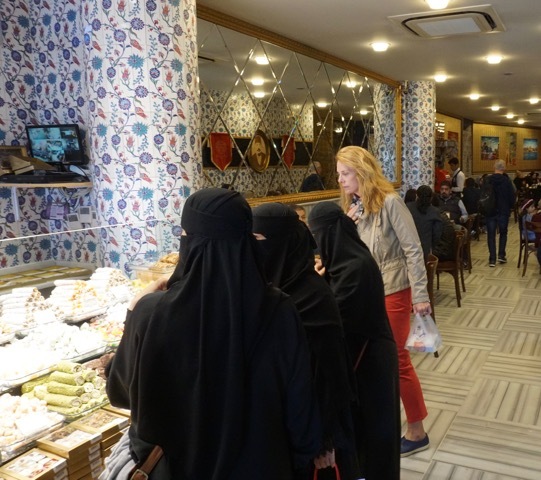 And the pictures are of Denmark, Abu Dhabi, Japan, Iceland, and Istanbul. To an armchair traveler, your adventures seem quite amazing. I’ll definitely have to check out your Finn Teller stories . . . . Twist, I followed a lot of your travel advice on my recent trip to Europe, all of it useful. The only thing I didn't end up using was the duct tape, but it was a handy tip, and one I'll use again. Thanks! Your adventures are so inspiring. Twist, I look forward to checking out your books. My partner and I enjoy our driving trips thru France most of all, getting off the main roads and following a one lane track to the top of a mountain, stopping in a little bistro and having lunch with the locals. We've had some of our best adventures there. Once in Brittany we dashed into a pub to get out of the rain. Sitting at a long table in front of the fire place were a half dozen elderly men, drinking wine and having a grand time, talking loudly and gesticulating, smoking their pipes and laughing. We ordered lunch, and while we waited, the men got up to leave. They lined, came over to our table, and each one bowed to me, kissed my hand and said "au revoir." I wasn't sure whether I felt honored or just like and aged crone. What an interesting travel philosophy! Maybe if I traveled all the time I could make that shift, but because when I do it's so special and I've picked the place because of what it offers... and because it's something I don't get (or don't get enough of) at home. We're just back from Iceland (I'll blog about it in a few weeks) and nature (& birds) were on our to-do list. I always try to go to the regional art museum in whatever destination -- that's where you see top quality work by artists you've never see before (as opposed to second-rate works by (or "school of") artists whose best are at the Uffizi). Ann, I'd go with "honored"
I couldn't agree more Twist. I love bookstores, so I always visit ones in the places I travel. Same with theater. I love it so much that if I am anywhere for a length of time, I want to see what their live theater is like. I've never been to New Orleans. I'm trying to balance the things I have to do-things I want to do-things people tell me to do in my planning. If I traveled more, I'd probably be better at it. Twist! Welcome! and xxoo Tell us your packing secrets, too. You must have it down to a science--and yet, somehow, you always look chic and fabulous. And I agree--tell us more about these books! Yes, I'd love the packing secrets too. After dragging large cases on and off trains this summer I have vowed to buy a complete lightweight wash in the sink wardrobe. Hi, Twist, welcome! And yes, please tell us your packing secrets! I love your travel ideas. I have over the years done most of the iconic things in London (although I'm always a little embarrassed to admit I've never been to the Tower, or gone up on the Eye...) But I tend to do the things I do at home; shop, cook, find new and interesting places to eat, walk, see friends. This is the way you get a feel for a city, I think, not by seeing monuments. Do tell us more about FAKE! Thank you, Joan! I hope you enjoy FAKE. Karen, I am glad you enjoy the travel tips! Duct tape has saved me more than once, patching everything from a broken suitcase to the hem of my ballgown when I was invited to an opera at La Scala. For those of you interested in more travel advice and product recommendations as well as writing news, subscribe to my monthly newsletter, Scribbles from Twist (go to my website, twistphelan.com, to sign up). 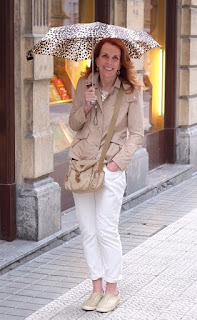 Susan Elia MacNeal, I am so glad you enjoy the travel posts! Hi Hallie! I hope you enjoyed Iceland. One of the photos above shows me riding an Icelandic horse near one of the glaciers there. Kristopher, I hear you about live performances. My last trip to London, I never made it to the Tate to see an exhibit I was interested in. I was waylaid by the theatre district, where I couldn't resist buying day-of-performance tickets for the evening shows! Mary, I'd take a bit from each of those categories. And it is okay to leave a place with things undone/sight unseen. Makes planning the return all the sweeter! Twist, I wound the duct tape around a short piece of drinking straw instead of a pencil. Deb, the London Eye is kind of overrated, anyway. I got very antsy with it. 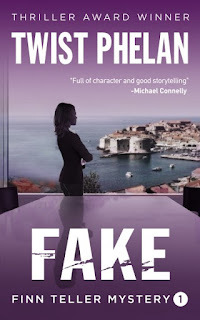 Thank you to all who asked about FAKE! It is the first in my Finn Teller corporate spy mystery series. Fiona "Finn" Teller is a tough, witty, good-looking, athletic woman with a high-risk, high-impact job: she is a corporate spy whose friends and family can never know just how dangerous her work is. Set in Italy and Croatia, FAKE shines a light on the netherworld of counterfeit goods. 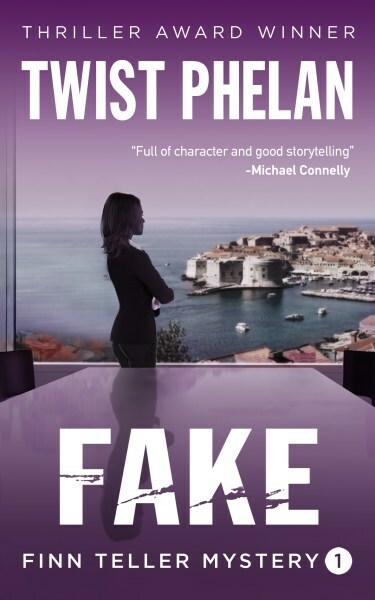 An assignment with a Milan fashion house leads Finn to an undercover investigation of a train wreck in Croatia—scene of her most tragic professional mistake and home to terrorists still out for revenge. The hunter becomes the hunted and the stakes skyrocket as Finn must win a race against the clock to stop the spread of a deadly African pandemic and escape with her life. I have been working on this project for four years, deciding to take the less conventional approach of releasing the books at monthly intervals instead of once a year. The second in series, EXIT, is set in Greece and went on sale last week. The third, DOUBT, will be out by the end of the month, with the fourth and fifth books to follow. Each novel takes place in a foreign place where I've spent time. Look for South America, India, Scandinavia, Asia, and Australia in the future! Deborah, I agree with your advice re: how to get to know a city! Karen, I like the straw idea! 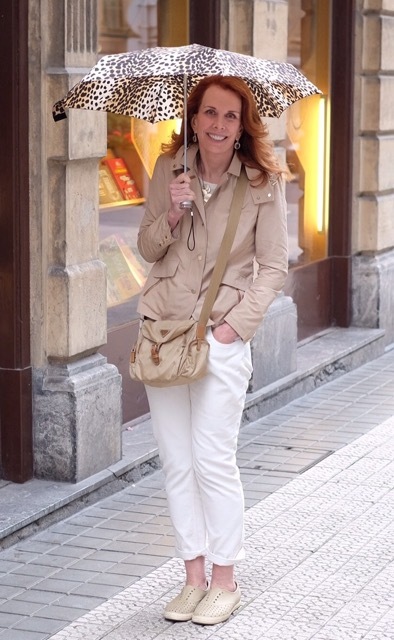 For those of you interested in travel tips and recommendations (everything from how to pack to navigating transportation options to losing that extra three--okay, usually five--pounds I always gain on a trip), keep an eye on my website/newsletter. I am in the midst of putting together a video series on how to be a more savvy traveler (without breaking the bank). Will be out later this year! I would love to be able to hit the road and travel whenever I feel like it. Too many responsibilities right now though. Your corporate spy books sound exciting. I will have to subscribe to your newsletter. I can always use travel advice for when I do get away. Usually my husband and I set up our own trips and play it by ear. Pat, I hope you enjoy the books and find the travel info useful! I understand about responsibilities; I am lucky in that as a writer, all I need to work is a laptop and a good WiFi connection. To all, I wish you bon voyage, wherever you may go. What a fabulous blog post. Travel on, Twist. Enjoy and, oh yes, keep writing! Twist, I have been lurking in the corners for a bit in following your travels on FB. You do the most interesting things and visit the most interesting places. I don't usually comment, just content to follow you, but I do hope to finally meet you at the upcoming Bouchercon. And, of course, I'm looking forward to reading the Finn Teller books. Oh, and how awesome of your husband to go with the flow and travel wherever you take him. Love all of the comments above! Did you also ski in a charity race in Sweden a while ago? Love reading your travel tales! Will you be at Malice Domestic 2017 or Bouchercon 2017 or both? Look forward to reading FAKE. Where did the name Finn Teller come from? Anon, so glad you enjoy the travel tales! I try to weave some of our adventures into the Finn books. Without spoiling anything, I can say I tried out what Finn does at the end of FAKE...and barely lived to write about it. And yes, I did ski in a race (in Norway)! I will be at Bouchercon; hope to meet you there. Where did the name "Finn Teller" come from? What a great question! (I've never been asked it before.) Finn is short for Fiona; gift of her Irish dad. The "Teller" is because one of her skills is reading people's body language. When she was barely in her teens, Finn realized she had the uncanny ability to tell when someone was lying. Big whopper or small fib, practiced perjury or off-the-cuff untruth--it didn’t matter: inconsistencies and untruths jumped out at her. Her half-Romanian mother said she'd inherited her "second sight." At first, Finn didn’t buy it; she didn't think she was unique. She thought she saw people as others did. But in her teens, after friends were awed by her “psychic” gift or avoided her so she wouldn’t discover their secrets, Finn understood her ability to read people wasn’t ordinary. As an actor on the road and a mariner in a family of generations of mariners, my father's rule for packing was "Take half as much as you need and twice as much money." By money he meant cash. That's good advice, Reine! People seem to forget you can usually buy what you need where you are going. Part of the fun is explaining what you are looking for in a language you don't know. Sand boarding should certainly be a lot of fun- none of the freezing cold. I'm so jealous of your adventures! I used to travel quite a bit back when I was teaching abroad, but now I can barely afford a trip a year. I have a similar travel philosophy; for me, food is the most important part of traveling, so that's what I spend the most time worrying about. Once food is taken care of, I'll hit up a few attractions that I find interesting (again, because I want to, not because I should), and spend the rest of the time wandering around to experience the place. I always check out the bookstores and grocery stores/markets of other countries; is it weird that I find them so interesting? Your book sounds really cool, btw. And I love the sandboarding pic! I taught for over 3 years in a small town in South Korea. Traveled all over Asia while I was out there. Siem Riep in Cambodia is a must. Angkor Wat is AMAZING. I've been there twice and would love to go again. 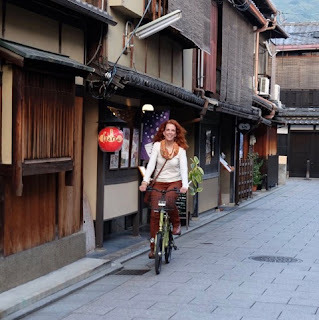 I've been to Tokyo, Osaka, and Kyoto in Japan and loved all three places, and have traveled all over South Korea. Seoul is great, but my favorite places are a port city named Busan and Jeju Island. My family is originally from the Philippines, which is a beautiful place. The island of Palawan has been voted best island in the world two years in a row, so that's a definite must-visit. How about you? What are some of your favorite destinations?